Find out what our experts have to say about Honda Livo! The Honda Livo is the Japanese bikemakers attempt to make a commuter motorcycle look premium and appealing. It’s well-built, has reliable mechanicals and a city-friendly 180mm ground clearance. The Livo’s performance is at par with the competition but its 8.5-litre fuel tank will require frequent top ups. The least priced variant is Honda Livo Drum CBS priced at Rs. 66,382 and the most priced variant is Honda Livo Disc CBS priced at Rs. 70,162. Choose the Honda Livo which fits the bill of you. Honda Motorcycle & Scooter India (HMSI) runs a close second place in the two-wheeler motorcycle segment, after the king of commuter bikes, Hero MotoCorp. We purposely mentioned “two-wheeler motorcycle segment” as Honda is the market leader in “two-wheelers”, with their famed Activa scooter which even outsells the best motorcycles. 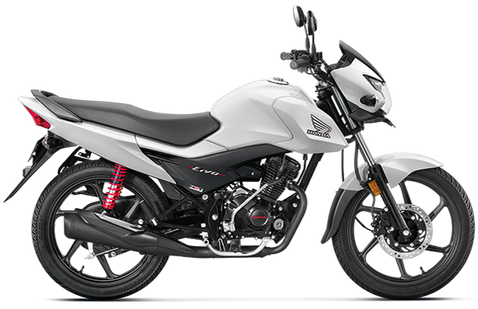 In the 110cc segment, Honda already has the Dream series with the Dream Yuga, Dream Neo, and the Dream DX (CD 110) catering to the mass market. But the Japanese motorcycle company decided to further intensify their onslaught against the competition from Hero Passion X Pro, Hero Splendor iSmart 110, TVS Star City Plus, TVS Victor, and the Mahindra Centuro, by launching the Livo. Honda Livo is a smart and sporty looking commuter bike from HMSI that redefines the way in which people look at plain, simple motorcycles. The Livo was launched alongside the Honda CB Twister in the entry level commuter segment and looked almost similar to it. When the Honda Livo was launched it was speculated that it would replace the CB Twister, which later proved to be true. The current model of the Livo looks very fresh with the redesigned graphics and new analog-digital meter keeps it technologically ahead. It looks a bit sporty yet mature that makes it an attractive proposition. Two variants are available for this sporty commuter bike. The one with the drum brake is available for Rs.56,980 while the premium disc brake variant retails at Rs.59,470. You would be completely wrong if you think Livo is based on the Dream series or just a cosmetic upgrade from them. All the bikes are different from one another in their own unique way. Livo has a premium look and does stand out in 110cc commuter segment. It even outshines some of the 125cc bikes too. Enhancing the frontal appeal is the aggressive headlamp with pilot lights and black visor. Clear lens turn indicators lend a classy look to the bike. Side profile of the bike is the best as it is here where the design really shines through. The fuel tank is well sculpted and the added side fairing to it gives it a sporty look. Sleek center and rear panels further complement the design. Tail-light looks good with the contoured grab bar which is shaped to match the rear section. Bright red colored rear suspension, 5-spoke alloy wheels and all-black engine highlight the sporty look of this bike. Instrument console has an innovative design with twin pod like sections. The left one has just the analog speedometer, whereas the one on the right is a digital console. With a white backlit screen, it displays the odometer, fuel gauge, trip meter, clock and a service reminder as well. The seat is long and with adequate padding feels very comfortable. Livo is available in 5 different colours - Black, Matte Axis Gray Metallic, Athletic Blue Metallic, Imperial Red Metallic and Sunset Brown Metallic. Livo is powered by the same engine, seen on the Dream series. So you get a 109.19cc, Air Cooled, 4 Stroke, SI Engine which produces a max power of 8.31bhp at 7500rpm and a peak torque 9.09Nm at 5000rpm. The Livo engine is compliant to the BSIV norms and runs on the Honda Eco Technology (HET) which makes the bike very fuel efficient. The engine is nice and refined as one would expect from a Honda bike. Clutch is very light and the gear shifts are very smooth owing to a hassle-free 4-speed gearbox. Livo has a fuel tank capacity of 8.5litres and gives a claimed mileage of 74kmpl. Honda claims a decent top speed of 86kmph for the Livo. Riding the Livo will feel like riding a 125cc bike, thanks to its built quality that offers good stability. Livo rides on a telescopic suspension at the front and a rear 5-step adjustable hydraulic spring-loaded suspension. Throttle response is very good and so is the pickup. Even though it's a sporty looking bike, the seating posture is upright and very comfortable. The 5-spoke alloys are covered in 18-inch 80/100 tubeless tyres in the front as well as the back. These Honda Eco Technology (HET) patented tyres are pretty good and offer a decent road grip. Braking power is superior to the Dream series as you get an option to go for the 240mm disc brake. If you don't go for that, then you get the standard 130mm drum brakes at both ends. With a basic commuter bike like the Livo, you can’t expect much safety features. But you can go for the disc brake variant which ensures your safety every time you hit the brakes. The bike is also equipped with AHO feature which increases its safety quotient. As mentioned earlier, Livo features the HET tyres which are low rolling resistance tubeless tyre technology patented by Honda. These unique tubeless tyres compared to the normal ones, provide lower rolling resistance thereby increasing the fuel efficiency.